This book offers significant new essays by leading scholars—William A. Sessions, John F. Desmond, Jill Peláez Baumgaertner, Ralph C. Wood, and John R. May—who have advanced the codification of O’Connor as a writer preoccupied with religious, and especially Catholic, themes. In counterbalance, the collection presents voices of sharp dissent—chiefly Joanne Halleran McMullen and Timothy P. Caron. These scholars find themselves at odds with O’Connor’s own interpretations and with much of the existing scholarship concerning her work. Contributors Helen R. Andretta, Stephen C. Behrendt, and Robert Donahoo explore theological, philosophical, and scholarly issues completely outside this dichotomy, such as comparative literature and the influence of consumer culture on her writing. The promise of such a diverse collection rests in the dialogues between and among their essays. One will not find consensus within these pages, nor even a settled path for the future of O’Connor studies. 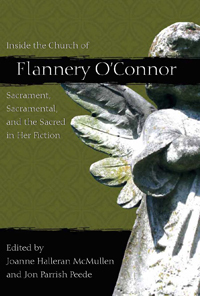 Rather, the collection puts on record the state of affairs during this period of transition, when those scholars who knew O’Connor personally are declining in number and canonical authority, and those who know her as a field of study as opposed to a flesh-and-blood human being are in ascension. Both groups have much to learn from each other.